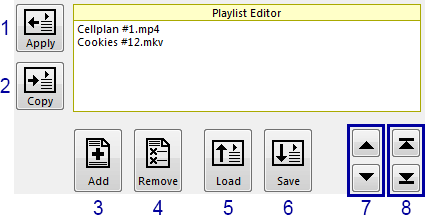 The playlist editor is used to browse the shared folder specified on the Zoom Presenter remote PC and create playlists based on content from the remotely shared folder. Activate the playlist on the remote screen and begin playback. Copy the current playlist from the remote screen into the playlist editor, clearing the previous playlist editor data in the process. Opens the remote media browser dialog (see screenshot on the right), to browse for and add media files the playlist editor. Clicking the 'Add' button or double clicking a media file in the remote media browser dialog adds the file(s) to the playlist editor but does not automatically close the media browser dialog (to quickly add multiple files). Hold down the Ctrl button to select multiple media files. Select one or more (by holding the Ctrl key) media files and click the button to remove the selected entries from the playlist editor. 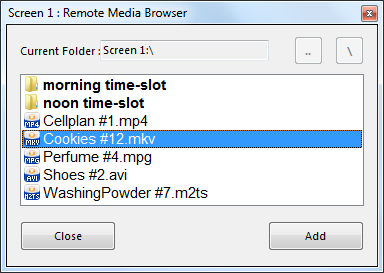 Opens the remote media browser dialog, to allow the selection of a playlist file. The existing playlist editor content is replaced with by the newly loaded playlist. Prompts for a playlist file name. The playlist file is saved under the '@ZPL' folder automatically. Move the selected item(s) up or down one entry in the playlist. Move the selected item(s) to the top or bottom of the playlist.